Restore your driveway block paving ...The easy way! Weathering, traffic, moss or mould growth and cleaning are all factors which take their toll on driveway block paving. The vibrant pigments which are so appealing in new paving are dulled by a combination of water, U.V exposure and abrasion. Your block paved driveways and patios have hard lives! Restore-A-Drive puts back the colour that the elements and wear and tear wash out. Formulated from a blend of premium resins and light-fast pigments, Restore-A-Drive penetrates deep into the block paving surface to leave a "natural" looking finish. We have extensively tested our wide range of driveway treatments so you can have peace of mind that they are of the highest quality. 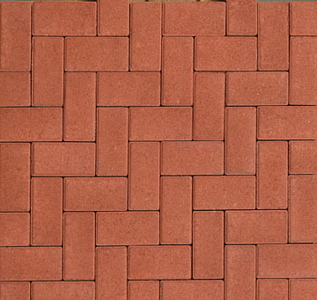 Block paved driveways and patios are often laid with subtly different shade blocks either for a mottled effect or to form a geometric design. Because Restore-A-Drive is a translucent liquid paving & driveway sealant it will actually enhance these original tones, even on badly faded surfaces. 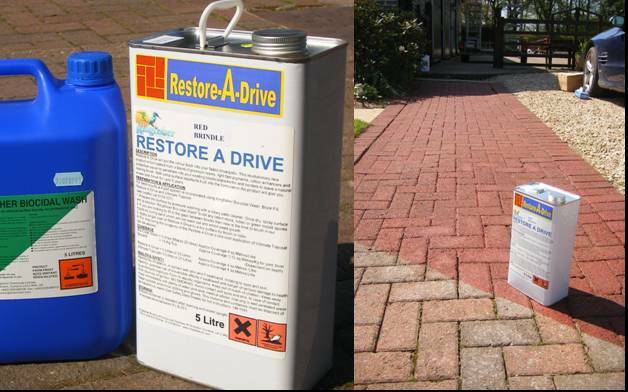 Restore-a-drive reseals the block paving in your driveway or patio and restores faded colours. To keep the newly restored drive looking its' best, ensure the block paving or natural stone is first cleaned using Bio-Wash Patio & Roof Cleaner or K-Seal Patio Cleaner to remove any algae or lichens, then top up any gaps between the paving tiles with a weed inhibiting grout such as Kingfisher Block Fill. Restore-A-Drive is an all-in-one block paving driveway/patio restoration treatment. As well as being a colour renovator it is also a high solids sealer which helps to repel water, light oils and grime. 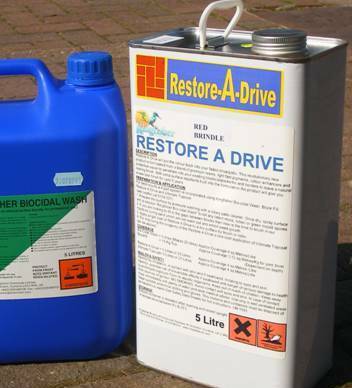 Restore-A-Drive is made using light-fast pigments to ensure prolonged life in direct sunlight. Applying Restore-A-Drive is simple. Once the block paved driveway or patio has been prepared by treating with patio cleaner then allowed to dry, you simply roller on the "Restore-A-Drive" driveway sealant to achieve a beautiful "new look" block paved driveway or patio. "Cut in" edges or awkward corners by brush applying. Restore-A-Drive is available in three shades to treat different original surface colours. Please take care to select the correct colour as Restore-A-Drive is a permanent finish. Four steps to the perfect finish!! Using Restore-a-drive in combination with the following kingfisher driveway products will give you a total driveway renovation. Our high-quality paving products will never fail to impress, offering an outstanding finish. 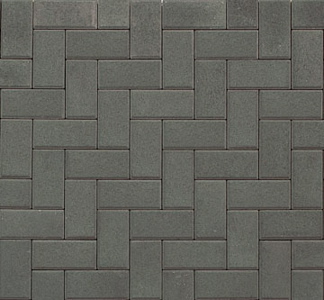 We manufacture our own paving range and supply only the best driveway treatments. Prepare the block paved surface by washing with a pressure washer fitted with a rotary patio cleaning tool. 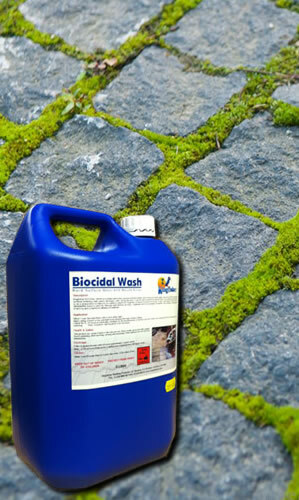 Once the paving is dry, spray the surface with a solution of Kingfisher Bio-Wash Patio Cleaner. This sanitising solution will kill any latent moss, lichen or green mould spores. Often when block paving in driveways and patios is cleaned it is necessary to "top-up" the joint sand. 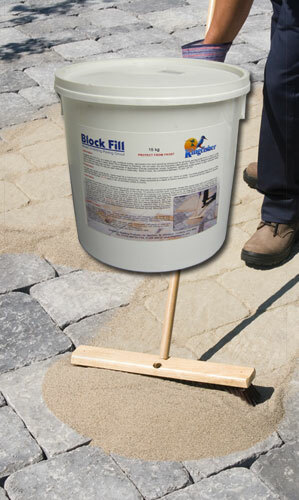 Unlike traditional sand Kingfisher Block-Fill is a moisture curing grout which will not wash out and inhibits weed growth. Easy brush-in application for joints 5mm or less. Apply a single coat of Restore-A-Drive evenly by brush or roller. Make sure that the driveway block paving is completely dry before applying Restore-A-Drive and that rain is not expected within 4 hours of application. Important! Restore-A-Drive is a translucent material and therefore the treated surface cures to a darker shade than the liquid. Ultimate Topcoat is our "high-solids" clear resin sealer which can be applied to most block paving materials. Used on a surface treated with Restore-A-Drive it will provide added protection, improving the longevity of the finish.